The judge in the Michael Jackson case has ruled that previous allegations of child abuse against the singer can be introduced as evidence in his trial. The prosecution wants to call five witnesses, including former child film star Macaulay Culkin - although he has always said he was never mistreated. Mr Jackson denies 10 charges, claiming a conspiracy against him. Observers say the ruling is a blow for Mr Jackson and could have a significant impact on the direction of the trial. Judge Rodney Melville announced his decision on Monday after hearing submissions in the jury's absence. The judge said he would allow the jury to hear about five boys whom the prosecution claim were sexually abused by the singer. "I'm going to permit testimony with regard to sexual offences and the alleged pattern of grooming activity by the defendant," Judge Melville said. However, prosecutor Thomas Sneddon said that only one alleged victim will testify. The most widely reported case involved a teenager, Jordan Chandler, who said he was abused by the pop star in 1993. The case was settled out of court, reportedly involving a payment of $26m. 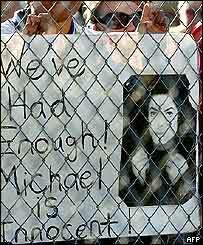 At the time, Mr Jackson vehemently denied anything improper ever took place and later said he chose to pay the boy a "considerable sum of money" to avoid being subjected to a "media circus" at a trial. The prosecution wants such evidence to back up and give credibility to the claim of Gavin Arvizo - the boy at the centre of the current trial. Gavin Arvizo says he was abused by the singer in 2003. The prosecution is hoping to expose similarities between the nature of the current allegations and those from a decade ago, says the BBC's Peter Bowes in Santa Maria, California. 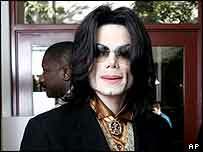 Mr Jackson's lawyer fought the admission of evidence, arguing that prosecutors were trying to bring in witnesses with grudges against the singer. "How can you just allow a parade of third-party characters to come in without any victims?" Thomas Mesereau asked. He pledged to stage a "mini-trial" for each individual allegation. "You can't stop the defence from putting on a full-blown defence and I mean just that," he said.